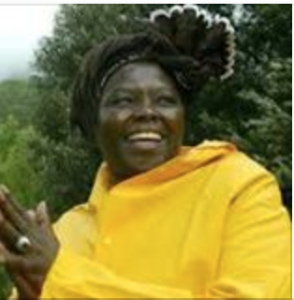 If you have scheduled or would like to schedule a screening or event that features Taking Root, Wangari Maathai’s life, or the work of the Green Belt Movement, please send us your information (takingrootfilm@gmail.com) so that we can share it with others who might be interested. Taking Root will be screened at the Caspar Community Center, 15051 Caspar Road on Wednesday, June 6th at 7:00 pm. Suggested donation $10. The filmmakers will be available in person for a Q&A following the film. Hosted by Occupy Natick, Taking Root will be screened at St. Paul's Episcopal Church, Sherrill Hall, 39 E. Central St., Natick, MA on Monday May 21st from 7:00 to 9:00 pm. The filmmakers will be available for a live Q&A following the film. Sponsored by Keep the Park Green, Taking Root will be screened at Main Street Landing House, 60 Lake Street, Burlington, VT on Saturday, May 19th at 4:00 pm and again at 7:30 pm. The filmmaker will be available for a Q&A following each showing. The event is free. St. Benedict the African- East Catholic Church, 340 W. 66th St.